Business signs of all varieties require maintenance and repair. Not only does routine maintenance clean a signs appearance, but depending on the sign, it can help with its functionality as well. Having a clear and visible sign helps pedestrians and motorists see your business name, and has additional functions. With the intricacies of sign service and repair, it’s important to take care of any issues your sign may be experiencing. Not all companies are licensed and certified to repair signs depending on their location and type. For instance, electrical, neon and powered signs require permits for service and installation. Furthermore, plaza, exterior, and traffic signs also require permits for repair and maintenance. The signage professionals at Testa and Sons are fully licensed and experienced to service and repair signs of all types. Service and maintenance of your sign are as important as the sign installation. Testa and Son’s team of technicians are stocked with the necessary tools to service any sign. From sign lamp replacement to retrofitting, Testa and Sons service all the sign types. We offer inspections during the day and night so imperfections can be found and serviced on site. Our maintenance service includes replacing parts and cleaning. A broken sign can place a blemish on a business’ name and makes it visually displeasing. Having a well-maintained sign impacts your business image, which is critical to the success of your company. Potentially, this can draw customers away as it is difficult to see where your business is located. Whether your sign is electrical or non-illuminated, Testa and Sons can repair your sign. Why Testa and Sons Sign Service and Repair? Testa and Sons have serviced businesses all along south Florida from Miami to Fort Lauderdale, and Palm Beach. With over 40 years of experience, we have serviced and repaired signs of all kinds. Our technicians are fully licensed and certified to repair electrical and non-electrical signs. 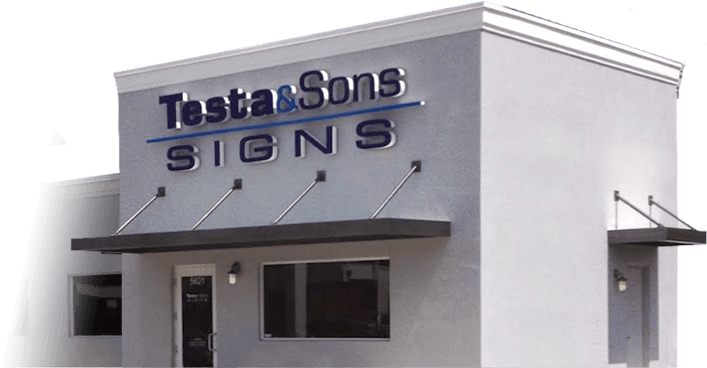 If you are in need of sign service and repair, contact Testa and Sons today for a quote.